I work about 20 minutes from the hospital, and last night it took me 3 and a half hours to get here. Fun stuff. Ahhh, snow. Gotta love it. Kinda. Annabelle officially has rhinovirus. Aka the Common Cold. Lacy has been a little under the weather earlier this week, and was here at the hospital all weekend, so this is probably the cause. However, one can never know if Lacy picked up the virus at the hospital either, so who knows! Please pray that this passes FAST and that Annabelle can fight it well. I’m worried (er concerned) because Annabelle’s poor heart function causes poor lung function, and well, obviously colds effect your lungs! Please pray that she can breathe well through the “gunk.” She’s already had to go to higher oxygen settings overnight, and is much more fussy today than she has been the last few days. Ugh, No fun. We're battling colds at our house too. I haven't gotten one yet (taking my echinacea pills like crazy), but it freaks me out when I visit my sister. I rub sanitizer on my hands about every 2 seconds when I'm there. So sorry! I will definetly be praying for Annabelle! Praying that the cold (with in and out) goes away fast!! Ugh…I am SO sorry. Colds (and, really, any virus, for that matter) are so scary for our kids, particularly before the Glenn, or in your case, transplant. 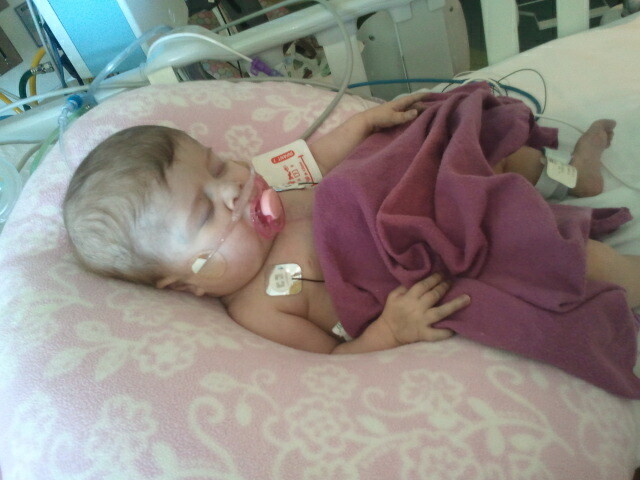 Praying her little body can find the strength to fight it off!!! Poor baby! I pray that she will heal quickly. That's no fun at all! Praying! Hope Annabel feels better soon. Oh, God bless her! I will pray specifically for this cold to pass quickly. Praying for this virus to pass quickly and Annabelle's body to fight it hard.